Larry “Lo-Lo” White spent much of his young life around a soul food kitchen at his grandmother’s Phoenix restaurant, Mrs. White’s Golden Rule Café. From there, he worked relentlessly to perfect his own authentic fried chicken, homemade waffles and maple syrup recipes. When he found just the right combination, he opened his first, small eatery—and by small we mean smaller than some New York apartments. Not long after, a handful of sports’ most admired players started showing up, including Charles Barkley, Shaq and Muhammad Ali. And the rest…well…you get the picture. Four establishments have since popped up in Arizona, including one at the Phoenix Airport, in case you’re ever in for a layover. 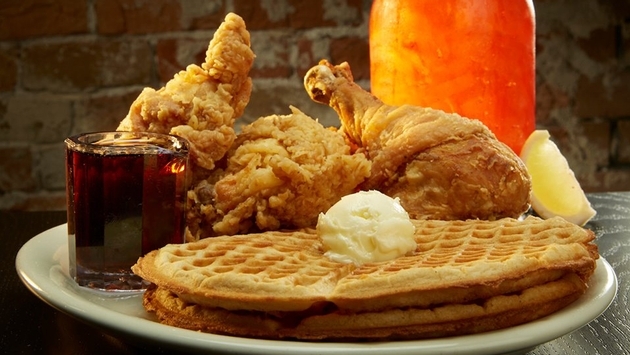 Of course, the menu item that made Lo-Lo’s famous is the one to try on your first visit: the golden fried-to-perfection chicken and its fluffy sweet waffled companions. Order the KK and you also get grits and eggs with cheese and onions. You also can’t go wrong with the Phat Azz Samich, fried chicken breast stuffed between a brioche bun and topped with BLT ingredients. Actually, just making the order sounds like a bit of good old harmless fun. As much as the mention of Lo-Lo’s Chicken & Waffles is about the poultry, the experience just wouldn’t be complete without dessert. With your choice of real Southern-style peach cobbler, bread pudding and banana pudding, you simply can’t go wrong.